Our range of microgreens and sprouting seeds have been bred specifically for this purpose with a focus on diversity of colour and form, flavour characteristics and seed quality in regards to time taken to germinate. 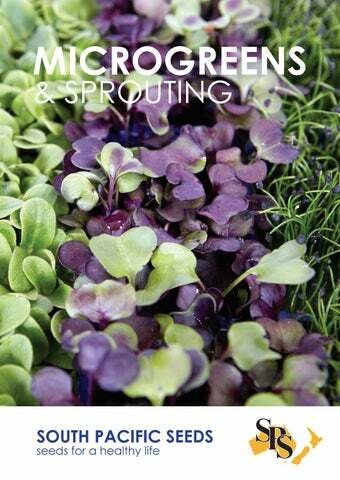 As a rich source of vitamins and antioxidants, microgreens and sprouts are popular among health conscious consumers. Given their palatability and intense or delicate flavour characteristics, microgreens and sprouts are interesting for chefs and are often included in a range of dishes for enriching the taste. The quality of the varieties detailed here is excellent, with seed of these varieties having to meet South Pacific Seeds minimum quality standards to ensure successful germination thereby providing certainty of production. 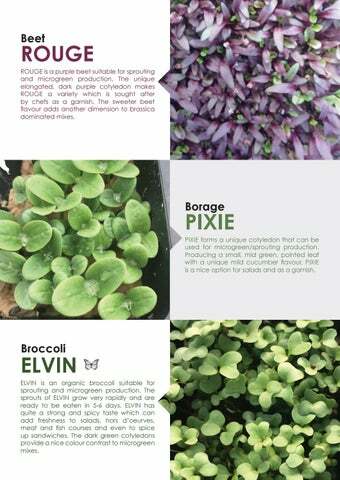 The current assortment encompasses a range of microgreen and sprouting seeds and we are happy to try and source other types if what you require is not detailed here. All our microgreen seeds are untreated. RASPBERRY RASPBERRY is a red amaranthus suitable for sprouting and microgreen production. RASPBERRY is a unique product with regards to flavour and cotyledon characteristics. The cotyledons are oval shaped with a slight point and have a vibrant red colour. PESTO PESTO is a green basil suitable for sprouting and microgreen production. A sweeter flavour, PESTO can be used to lift mustard dominated mixes or as a stand-alone product. High quality seed that will ensure even germination for the uniform production of sprouts or microgreens. THUMBELINA THUMBELINA is a purple basil suitable for sprouting and microgreen production. Very quick to produce cotyledons, THUMBELINA will be ready for harvest in 5-6 days from sowing. Highly aromatic and with mixed purple/green cotyledon colour, THUMBELINA provides a unique element to mixes. ROUGE ROUGE is a purple beet suitable for sprouting and microgreen production. The unique elongated, dark purple cotyledon makes ROUGE a variety which is sought after by chefs as a garnish. The sweeter beet flavour adds another dimension to brassica dominated mixes. PIXIE PIXIE forms a unique cotyledon that can be used for microgreen/sprouting production. Producing a small, mid green, pointed leaf with a unique mild cucumber flavour, PIXIE is a nice option for salads and as a garnish. ELVIN ELVIN is an organic broccoli suitable for sprouting and microgreen production. The sprouts of ELVIN grow very rapidly and are ready to be eaten in 5-6 days. ELVIN has quite a strong and spicy taste which can add freshness to salads, hors dâ&#x20AC;&#x2122;oeurves, meat and fish courses and even to spice up sandwiches. The dark green cotyledons provide a nice colour contrast to microgreen mixes. FIRA is a broccoli specifically bred for the sprouting and microgreen market. FIRA produces an attractive green leaf with a light green stem which offers a strong spicy brassica flavour. Quick to emerge, this variety will be ready for harvest in 5-7 days. MARABELLA MARABELLA is a red cabbage bred specifically for sprouting and microgreen production. Very quick to produce cotyledons, MARABELLA will be ready for harvesting in 5-6 days from sowing. 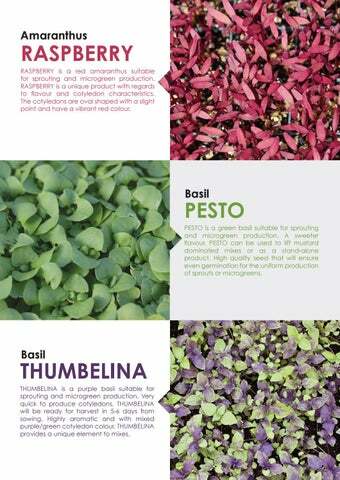 The ideal product for adding strong brassica flavour and an attractive green/purple colour to microgreen mixes. MOJITO MOJITO is an aromatic coriander suitable for sprouting and microgreen production. The distinct aroma and flavour characteristics make MOJITO a variety that is sought after by chefs as a garnish. MOJITO will also â&#x20AC;&#x2DC;liftâ&#x20AC;&#x2122; mustard dominated mixes. BLINKY BLINKY is a green cress bred specifically for sprouting and microgreen production. BLINKY is a softer, more delicate taste for subduing mustard dominated mixes or as a stand-alone product. An oval leaf shape, BLINKY has attractive presentation. BIBBLE BIBBLE is a pink kohlrabi bred specifically for sprouting and microgreen production. The contrast between the stem and cotyledon colour of BIBBLE has eye appeal for sprout and microgreen mixes. With a subtle flavour BIBBLE is interesting as a stand-alone product also. BORDEAUX BORDEAUX is a green mustard suitable for sprouting and microgreen production. The softer leaf of BORDEAUX provides a different textural element to sprout and microgreen mixes. BORDEAUX has a strong mustard flavour that is quite savoury. LOLLIPOP LOLLIPOP is a purple orach suitable for sprouting and microgreen production. The cotyledons of LOLLIPOP have a more elongated shape which provides a unique element to sprout and microgreen mixes. LOLLIPOP will add another flavour dimension to brassica dominated mixes. ENVY ENVY is an Italian parsley suitable for sprouting and microgreen production. With aromatic appeal, ENVY is popular for lifting microgreen mixes which can be dominated by mustard flavours. Slightly slower to germinate than many other sprouting and microgreen varieties. BOBBIN BOBBIN is bred specifically for sprouting and microgreen production. BOBBIN produces a crisp, white stem with bright green leaf. BOBBIN offers growers an attractive option for sprouting and microgreen mixes. BOBBIN has a strong radish flavour. SANGRIA SANGRIA is a purple radish bred specifically for sprouting and microgreen production. SANGRIA is a pure seed line with very low numbers of off-types (green cotyledons) common in many alternative varieties. With a subtle flavour, SANGRIA will add colour and vibrancy to green dominated sprout and microgreen mixes. DISCLAIMER The information provided here is based on an average of data and observations collected from our trials. Significant variations may occur in the performance due to a range of conditions including cultural/ management practices, climate, soil type and geographic location. As a consequence South Pacific Seeds (NZ) Ltd cannot accept liability as to accuracy of this information. March 2019. Seed supplied by South Pacific Seeds for the purpose of producing microgreens or sprouts can only be supplied as untreated. South Pacific Seeds will not be held liable for any treated seed that is used by the grower for the purpose of producing microgreens or sprouts. In addition, seed that is sold by South Pacific Seeds for producing microgreens or sprouts is tested for the presence of E.coli and Salmonella and will not be sold if levels exceed industry accepted thresholds currently: â&#x20AC;˘	Salmonella; nil detected â&#x20AC;˘	E. coli ; less than 100 cfu/g The risks of foodborne disease are present from seed to plate. Strategies and procedures, supported by research, helps to control contamination and incidence. Microbial analysis of seeds may help identify highly contaminated lots. Customers must be aware that negative results do not guarantee pathogen free seeds because of analytical and sampling limitations, as a result South Pacific Seeds will not be held liable. Testing of seed for foodborne pathogens is carried out by laboratories that are part of the International Laboratory Accreditation Cooperation. Our range of microgreens and sprouting seeds have been bred specifically for this purpose with a focus on diversity of colour and form, flavour characteristics and seed quality in regards to time taken to germinate. The quality of the varieties detailed here is excellent, with seed of these varieties having to meet South Pacific Seeds minimum quality standards to ensure successful germination thereby providing certainty of production.